​Guide Hall clean up of the grounds. Kindly contact Justin Leon P&C President (Mob: 0417 438 544) at the school office. 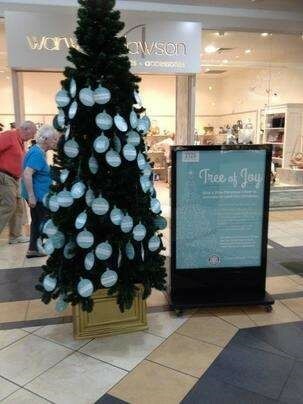 It is now time for the Club to commence planning for this year’s Tree of Joy. Already the Centre Management is “onside”, decorations up and the Tree will be ready for the cards on Monday 7th November and the collection will close, at least nominally, on Wednesday 14th December, and distribution on Friday 16th. The Tree of Joy is the Club project where we organize collection of Christmas gifts from the Community of Cherrybrook in association with Cherrybrook Shopping Village, for distribution via charities to disadvantaged people. Any member of the Club is welcome to be part of the committee and project; if you want more information please talk to me or one of last year’s committee. At the most recent meeting Neville supplied each table with a multi-page form seeking people availability. Several Members were unable to fill in these pages as their diary was at home. ​Here is a link to People Availability to enable you to indicate when you are available. ​Please return to Neville on completion. When you have finished filling in the form, you need to save it and email a copy to Neville. ​The website is not all seeing, all knowing and does not know what you have entered. Amelia's August Report can now be found at Amelia's Reports. ​Note: At the bottom right of each of Amelia's reports is a link back to Club Bulletin. ​Worldwide, 67 million children have no access to education, and more than 775 million people over the age of 15 are illiterate. Our members support educational projects that provide technology, teacher training, vocational training teams, student meal programs, and low-cost textbooks to communities. Our goal is to strengthen the capacity of communities to support basic education and literacy, reduce gender disparity in education, and increase adult literacy. 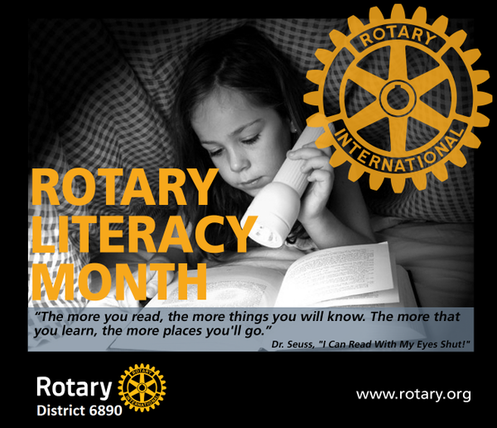 Bridge the education gap: take action during Rotary Literacy Month..
Combating illiteracy has been a major focus of Rotary International since 1986 – and for good reason. UNESCO estimates that despite rising literacy rates for youth and adults, there are over 800 million illiterate adults in the world and about two-thirds of them are women. More than 57 million children of primary school age are not in school. 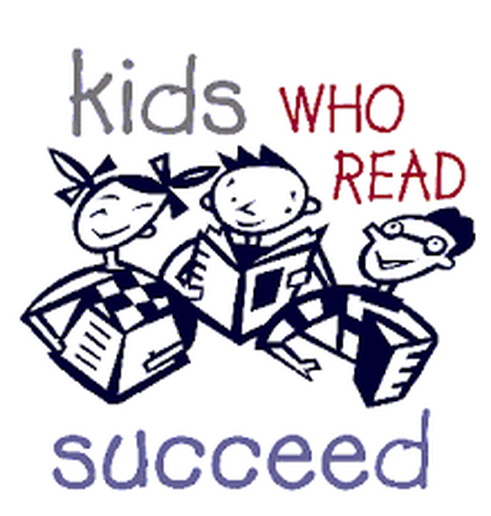 Millions more are functionally illiterate, without the reading and writing skills necessary for everyday life. Hands up those that can remember reading under the bedclothes cause mum decided it was lights out time. 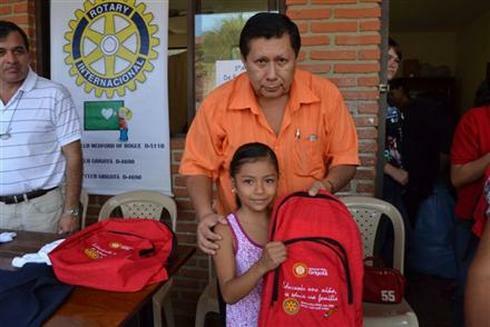 The Rotary Club of Grigota, Bolivia, undertook an advocacy initiative to inform families on the importance of children, especially girls, receiving a basic .education. Every child has the right to go to school, without danger or discrimination. 59 million children around the world don't have access to basic education. 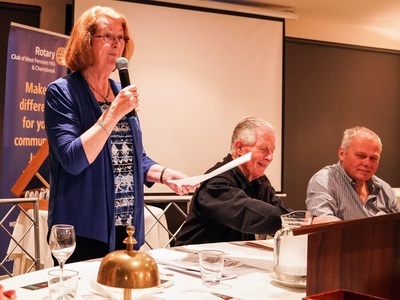 What an interesting speaker we had in Sue Butler, the editor from the Macquarie Dictionary. The inclusion of new words into the dictionary proved to be a talking point. There were many questions which always shows the speaker was well received. 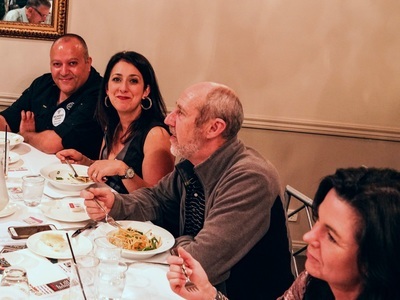 It was lovely to have 4 guests tonight – Joe Touma, Affy Badri, John Dale and Angelo Casamento. 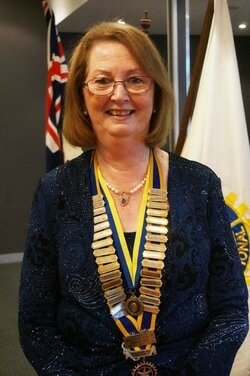 Carol Russell has to be congratulated for always thinking of Rotary and our club. 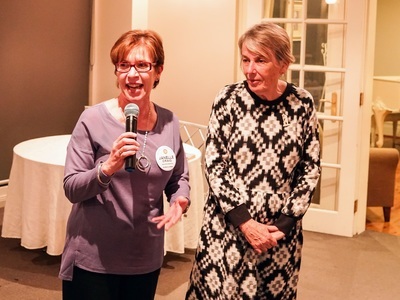 We hope our guests enjoyed the night full of much fun and frivolity. Congratulations to the PR/Marketing team for having items in the local paper and again to Keith Ball for recognition of the website from the Rotary Club of South Penrith. Well-deserved on both counts. 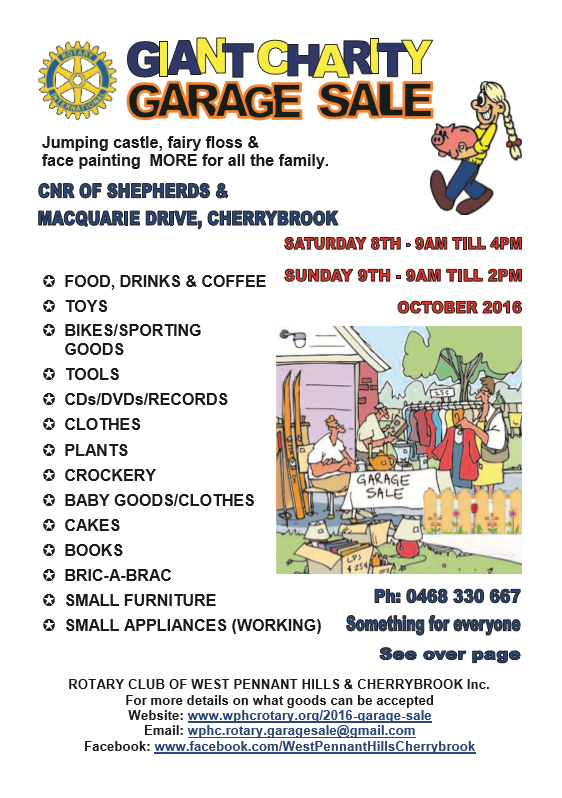 We also need help with DIK on Sat 17th September and the Bunnings BBQ on October 2nd. 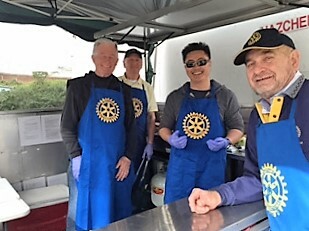 We can certainly serve humanity through Rotary at the moment. Next meeting is a partner’s night. 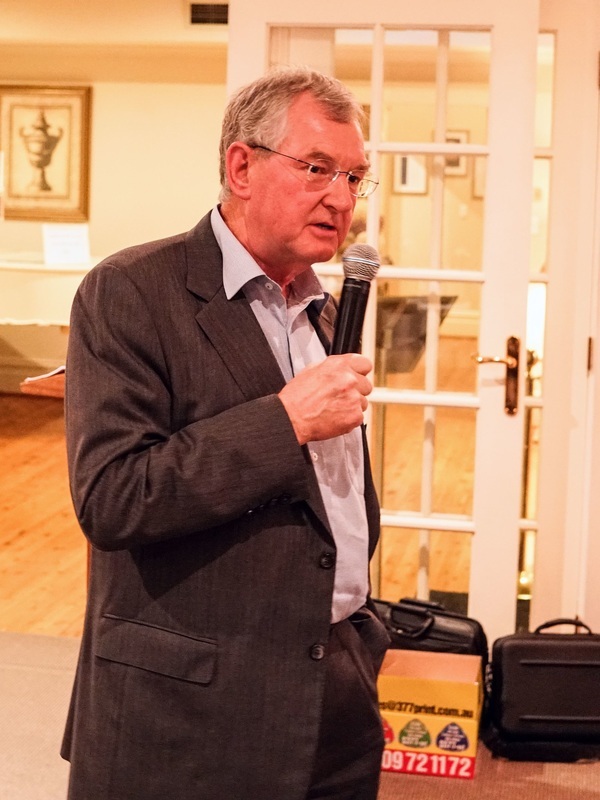 Unfortunately our guest speaker has had a death in the family but we will fill the evening so that it will be entertaining. It is our last partner’s night before the Garage Sale so please consider attending. Please remember to book your partner in. Have a good week and keep well. President Rosemary Clarke welcomed everyone, including guests Angelo Casamento, Rebecca Raad, Joe Touma (Rebecca’s dad), Affy Badri, John Dale and our guest speaker from Macquarie Dictionary, Sue Butler. Angelo will be inducted next Monday 19 September. 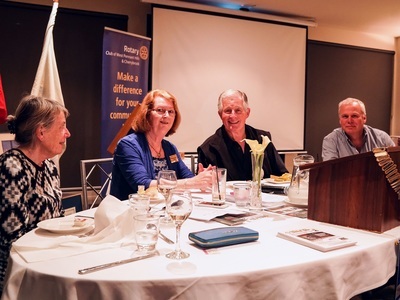 The Rotary Fact for the night was on Basic Education Literacy month and so it was fitting that Sue Butler from Macquarie Dictionary was there to speak to us. 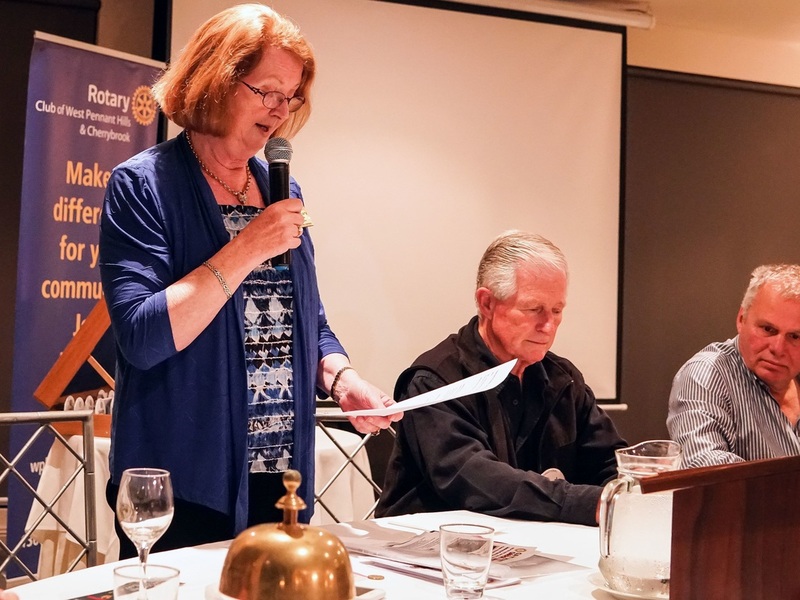 In 2015-16 Rotary Foundation awarded $8.3M in grants to support basic education and literacy projects. These projects are worldwide, ranging from providing computers and school supplies in Ghana to developing a literacy and mentoring program for Roma girls in Bosnia to address the gender imbalance in that part of the world. 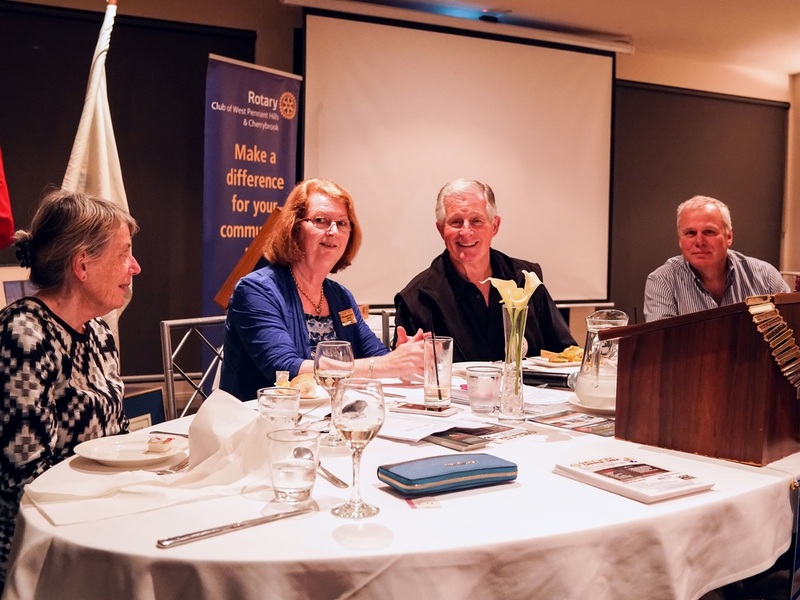 Chris Holden (Rotary Club of Nepean) rang Rosemary and said that he thought that our club’s website and Facebook page were the best he had seen and would we mind if they copied the layout. Hence congratulations to Keith Ball (website) and Colin Sharpe and Charlie McCartney (Facebook). 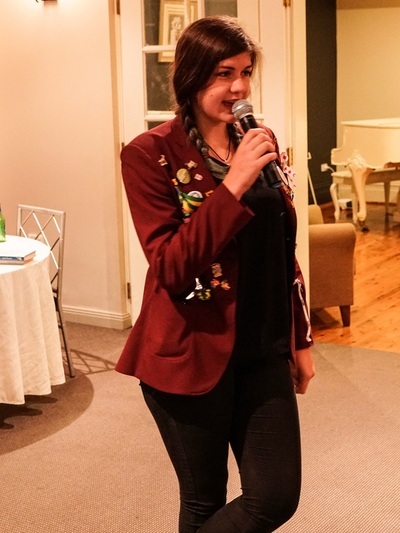 Sarah’s report – not much happened in the last week, with the exception of dinner last Friday evening with the Laroumanie family (Anna is our outbound student going to Japan) where she had Nutella pizza. 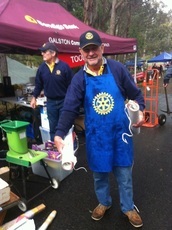 Ian Roberts – Bunnings Dural BBQ on Sunday 2 October (weekend before Garage Sale). He is looking for volunteers. Tony Makin – DIK on Saturday 24th September (a week Saturday) DIK is loading hospital beds and mattresses into a container bound for Africa. They need our help. If you haven’t done this before, it is a couple of hours of fun lugging stuff into a container and getting as much in as possible. Note the location is different from other DIK exercises. The warehouse is at 12 Anella Avenue, Castle Hill – easy to find: Turn left into Victoria Road from Showground Road, Turn left at the first roundabout – this is Anella Avenue – Number 12 is right in the corner at the first bend in the road. Start 8.30am Saturday 24th and you will be finished by 12.00 noon. 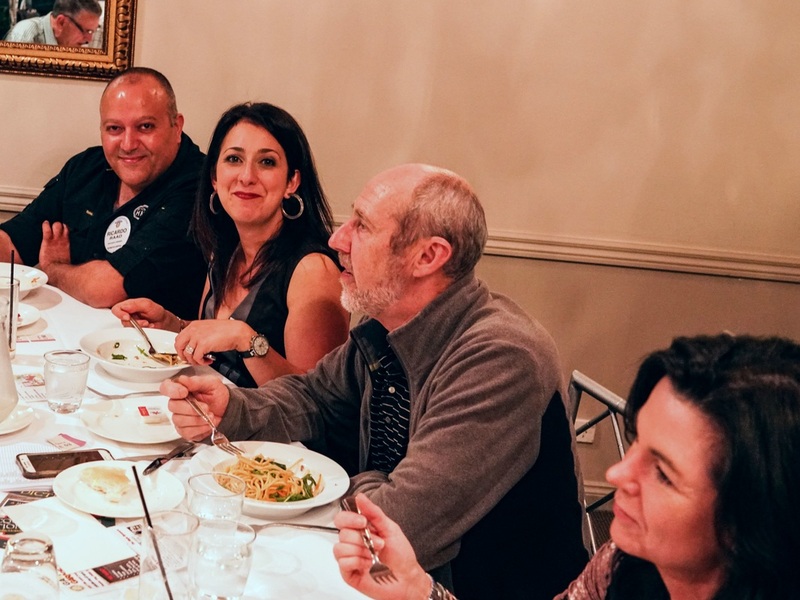 Partners are welcome – why should they miss out on the fun? 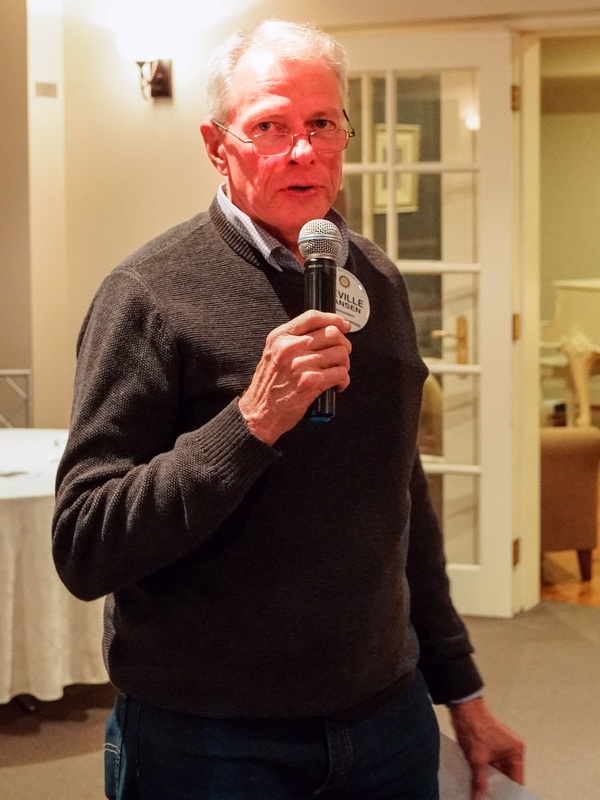 He needs an indication of numbers so if you will not be at the next meeting on Monday, please reply by email. Garage Sale – most members & partners have filled in attendance forms. Those that haven’t please fill them in and get them back to Neville Hansen ASAP. The forms (in excel format) can be downloaded from our website, however once you have filled them in you need to email them back to Neville. 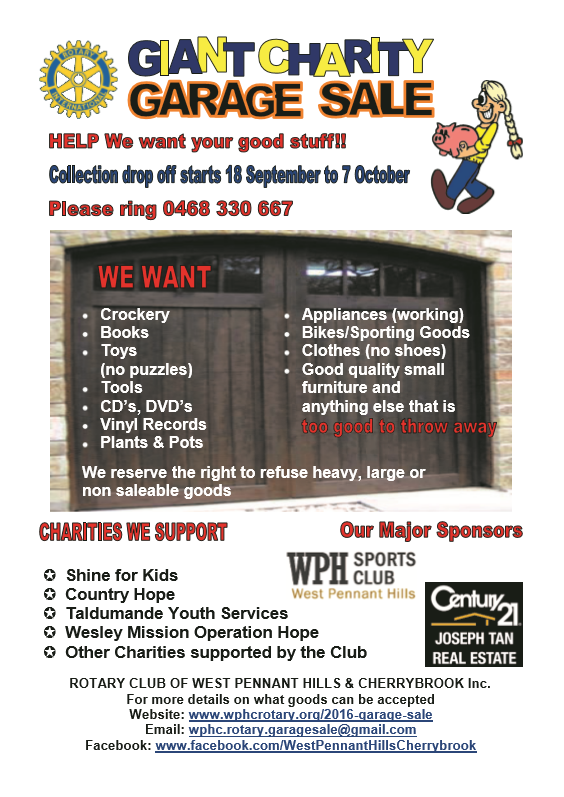 Just under 4 weeks until the garage sale. The letter box drops have gone out (update – as of Wednesday 14 September have been completed). 20,000 A5 flyers were printed and 17,000 were delivered to letter boxes. There are 2,000 flyers available to hand out. Please take some if you have somewhere to hand them out. 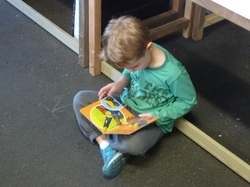 The garage sale website page is up and running, as well as numerous posts on our Facebook page. There will be a meeting of stall leaders next Thursday (15th) evening at 7.30pm at Neville’s house. 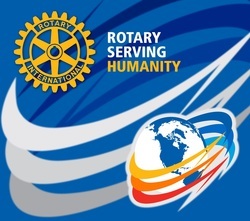 There have been 30 calls to the rotary mobile number so far, with around 8% pickups scheduled. Neville will send out an email to members who have volunteered for picking up and drop offs when to remind them of dates and times that they will be required. All hands are needed on deck! 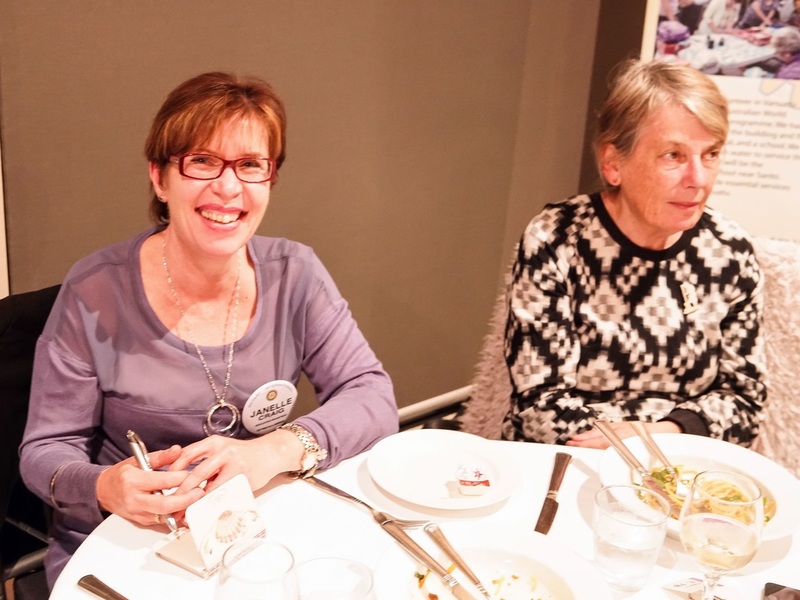 Carol grew up on a dairy farm in the Hunter Valley, next to a number of Pitt St farmer properties. Her family had to work hard (24x7) to make a living. She has two brothers and one sister. Her dad sold the farm when the milk quotas were brought in and he then became the first commercial chicken grower for Steggles. They had up to 60,000 one day old chicks at one time for rearing. At 17 she went to Business College and at the end of the first year was offered a job. She was the founding Director of a women’s refuge in Maitland. In those days the Government funded them and Carol was the treasurer. She married and had two daughters and then divorced. She married again and then decided that being single was better. 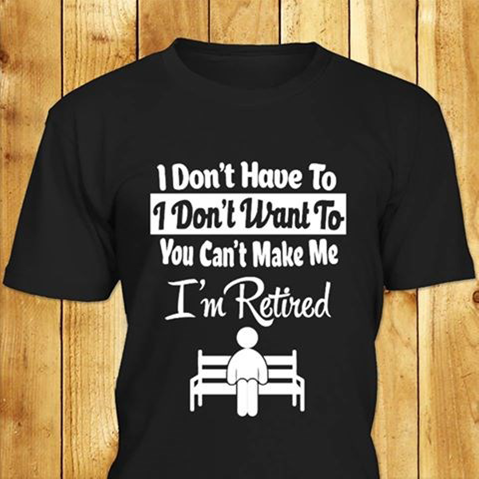 She has 3 grandchildren (9, 7 and 4) and two stepchildren. 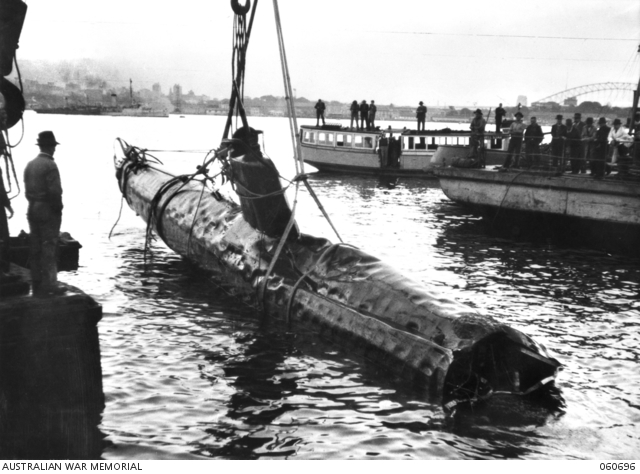 She has been in Sydney for 22 years, the first 12 years on the northern beaches. She had a dependent daughter when her marriage finished and she went and temped taking on admin and PA jobs that other temps wouldn’t take. She saw a job for a trainee financial advisor and worked for Westpac for five years and the Suncorp as a business financial advisor. In 2009 the GFC hit and she left Suncorp and had a 3 month holiday. One day she was walking through Castle Towers and bought a ticket in a trailer raffle being run by the Club. Steve Baker sold her the ticket! 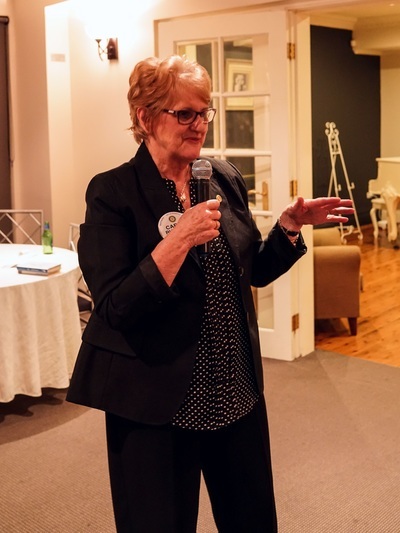 She trained as a marriage celebrant and one day her daughter suggested that she look at working with Yellow Brick Road, which she has been with now for 7 years. 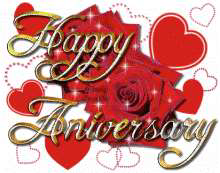 She still acts as a marriage celebrant every now and again. Business is now going well and now drives her as she now is a mortgage broker, financial advisor and wealth manager. The guest speaker was Sue Butler who is the Editor of the Macquarie Dictionary. She gave a presentation on the power of the Macquarie Dictionary. Janelle Craig was the speaker host. 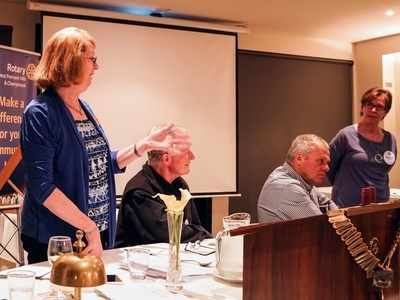 Susan Butler is a former teacher, one of the last to teach Latin in high school before both it and classical Greek were cut from Australian syllabuses (syllabi is listed second in Macquarie Dictionary). 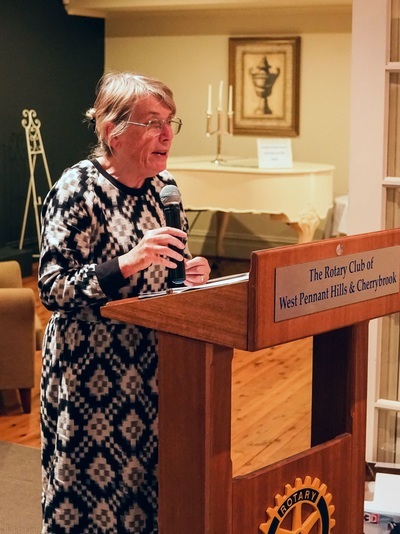 In 1970 she applied for the job of a research assistant on a new dictionary project that would become the leading authority on the Australian version of English, the Macquarie Dictionary, and today she's the editor. Her latest book The Aitch Factor is a collection of essays, thoughts, ideas and explanations about the challenges she faces in the job and the places they come from. Many people assume that she has incredible power over culture, however she likens it to “cleaning up after a party - sweeping up the mess and sorting it all away tidily” Her job is to observe, describe, record and leave it at that. She is always on the lookout for enduring words, with the rest going to “trash”. The changing usage notes in the dictionary show there is a clear generational shift going on in language. She says the role of the dictionary is to record the words people use and the way they use them. The race is on to get the newest of newest words. In 2008 the word ‘bromance’ was added to the Macquarie Dictionary and was used to describe the relationship between Trump and Putin. By the end of the year, words like lookbook (an online portfolio of photos) and mancation (a men-only vacation) were also added. YOUSE has been common in Britain for some time now and is usually an (understood) ­abbreviation for ‘you all’ or ‘you both’ and is now coming into use in Australia much to the horror of most Australians. It used to take a long time to bring out an edition of a dictionary as it had to be printed. They used to bring them out in 50 year spans for 3rd, 4th, 5th, etc editions. Nowadays, dictionaries are used more on-line than printed versions. The majority of their revenue now comes from online usage. David Turnbull won the raffle and heads & tails was won by Angelo Casamento. A board meeting will be held at Max Henderson’s house on Wednesday evening and a Stall Leaders meeting will be held at Neville Hansen’s house on Thursday evening at 7.30pm. ​Next week is a partner’s night and the guest speaker will give a presentation on psychiatric service dogs. A man who'd just died is delivered to a local mortuary wearing an expensive, expertly tailored black suit. The female blonde mortician asks the deceased's wife how she would like the body dressed. She points out that the man does look good in the black suit he is already wearing. To her astonishment, the blonde mortician presents her with the blank check. 'There's no charge,' she says. 'No, really, I must compensate you for the cost of that exquisite blue suit!' she says. 'Honestly, ma'am,' the blonde says, 'it cost nothing. You see, a deceased gentleman of about your husband's size was brought in shortly after you left yesterday, and he was wearing an attractive blue suit.